The UM URL Shortener provides a shortened URL for easy sharing and typing, by generating a URL with 8 characters & QR Code from any long URL. For example, the short URL https://go.um.edu.mo/z4afl1ab takes people to https://icto.um.edu.mo/communication-collaboration/um-url-shortener/. UM URL Shortener Service also provides scanning for external URL and page view statistics. 1. 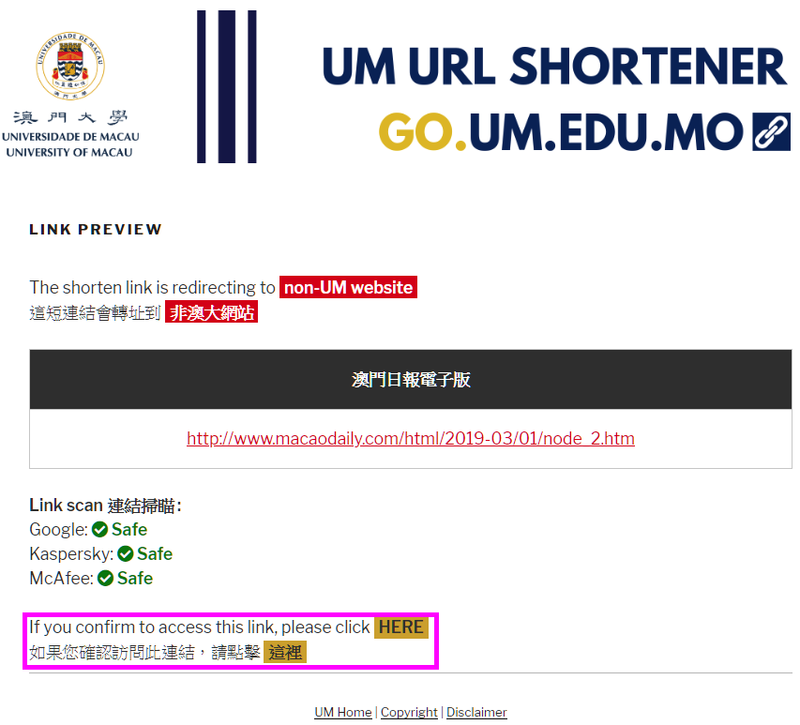 Visit UM URL Shortener site at https://go.um.edu.mo and login with your UMPASS account. 2. Enter the target URL into the input box. 3. The 8 characters shorten link is created automatically. 4. Click “Create” to create the shorten link. 5. All the links and QR code you create will list in “All Shorten Links” page. 6. “Clicks/Uniq” can see how many people have clicked on your URL visiting your shorted URL. If the shorten link is redirecting to non-UM website, user will see a Link Preview page showing the information of the target link and the Link Scan* will proceed before redirection. Users can click “HERE” to access the website. *The target link is scanned by 3 public service providers: Google, Kaspersky and McAfee. For more information about URL Shortener, please refer to ICTO website and ICTO Knowledge Base.